KEF unveils Q50a Dolby Atmos speakers | What Hi-Fi? 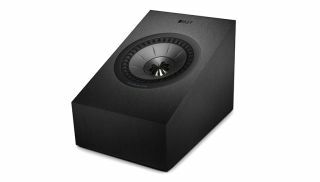 Adding to its array of Q Series speakers, KEF has announced the Q50a: an upfiring, Dolby Atmos-compatible surround speaker, which will bring an extra dimension to your home cinema sound (provided you have a compatible amp and suitable content). KEF has used a light cone return, improved spider suspension, and a new kind of neck decoupler to "create excellent dynamics with a supremely accurate, fast, and clean sonic response". It's a bold claim, but if their performance is as good as the company's Q350 speakers - which use similar Uni-Q driver technology - you won't find us complaining. Designed to be placed on top of front and rear satellite speakers, the Q50as can also be mounted on the wall using their dedicated keyhole fixings for added flexibility. Priced at £450 per pair, the KEFs are available to buy now.